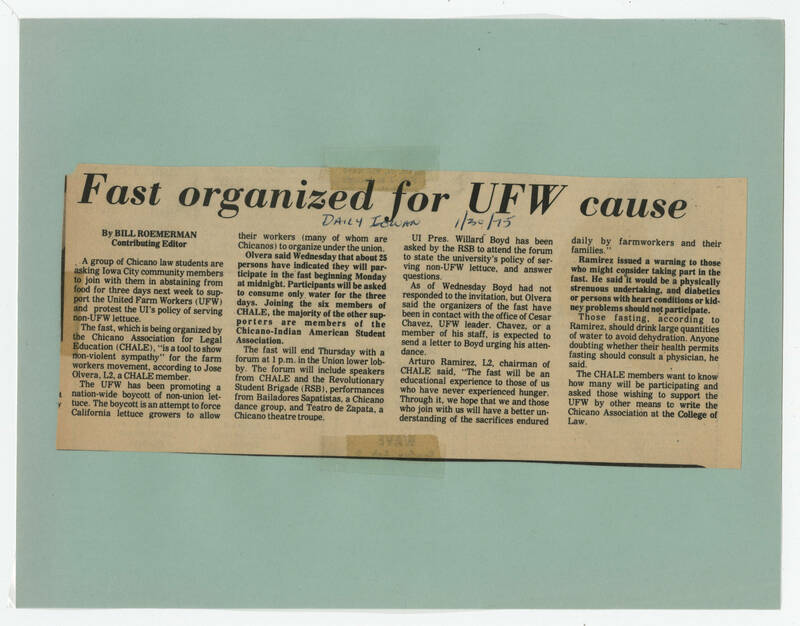 [[Header]] Fast organized for UFW cause [[end header]] [[Handwriting]] DAILY IOWAN 1/30/75 [[end handwriting]] [[bold]] By BILL ROEMERMAN Contributing Editor [[end bold]] [[Article text]] A group of Chicano law students are asking Iowa City community members to join them in abstaining from food for three days next week to support the United Farm Workers (UF) and protest UI's policy of serving non-UFW lettuce. The fast, which is being organized by the Chicano association for Legal Education (CHALE), "is a tool to show non-violent sympathy" for the farm workers movement according to Jose Olvera, L2, a CHALE member. The UFW has been promoting a nation-wide boycott of non-union lettuce. The boycott is an attempt to force California lettuce growers to allow their workers (many of whom are Chicanos) to organize under the union. [[bold]]Olvera said Wednesday that about 25 persons have indicated they will participate in the fast beginning Monday at midnight. Participants will be asked to consume only water for three days. Joining the six members of CHALE, the majority of the other supporters are members of the Chicano-Indian American Student Association. [[end bold]] The fast will end Thursday with a forum at 1 p.m. in the Union lower lobby. The forum will include speakers from CHALE and the Revolutionary Student Brigatde (RSB), performances from Bailadores Sapatistas, a Chicano dance group, and Teatro de Zapata, a Chicano theatre troupe. UI Pres. Willard Boyd had been asked by the RSB to attend the forum to state the university's policy of serving non-UFW lettuce, and answer questions. As of Wednesday Boyd had not responded to the invitation, but Olvera said the organizers of the fast have been in contact with the office of Cesar Chavez, UFW leader. Chavez, or a member of his staff, is expected to send a letter to Boyd urging his attendance. Arturo Ramirez, L2, chairman of CHALE, said, "The fast will be an educational experience to those of us who have never experienced hunger. Through it, we hope that we and those who join with us will have a better understanding of the sacrifices endured daily by farmworkers and their families." [[bold]]Ramirez issued a warning to those who might consider taking part in the fast. He said it would be a physically strenuous undertaking, and diabetics or persons withe heart conditions or kidney problems should not participate. [[end bold]] Those fasting, according to Ramirez, should drink large quantities of water to avoid dehydration. Anyone doubting whether their health permits fasting should consult a physician, he said. The CHALE members want to know how many will be participating and asked those wishing to support the UFW by other means to write the Chicano Association at the College of Law.